Marilyn Hubbard presented a program on the Quilt Museum to the Carrollton Kiwanis Club on Friday April 5, at Sunset Hills Country Club. Marilyn's father is Ellis Merrell, a charter member of the Carrollton Kiwanis Club. 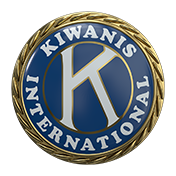 In memory of her father, she wore his Hixson Medalion and Kiwanis pin.